HTPO offers licensed landscape architecture services to public and private clients in Minnesota and North Dakota. Our landscape architecture services range from tree and plant identification to concept planning and fully developed landscape plans. We enjoy the challenges involved in designing environmentally conscious and aesthetically pleasing projects. HTPO can provide concept planning and site planning for city parks, subdivisions, commercial business parks, institutional entities, and beyond. 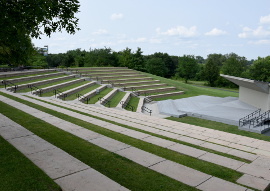 HTPO has designed a wide variety of park and recreation facilities ranging from sports facilities to neighborhood parks and amphitheaters that serve the needs of the community. HTPO has a landscape architect on staff to identify and evaluate the existing trees on your property. 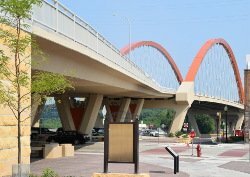 HTPO has worked on numerous vegetation plans for MnDOT design-build projects. We can identify noxious weeds and provide soil management, and tree protection plans. 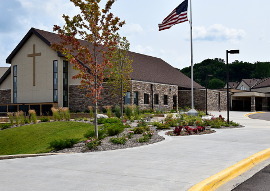 HTPO has professional staff with extensive experience in Construction Administration and we have Landscape Specialists certified through MnDOT. HTPO can evaluate your site to provide environmentally conscious solutions through restoring woods, prairies, and wetlands. 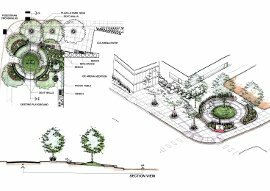 HTPO provides landscape design, planting plans, and specifications for projects ranging from schools, churches, and business centers, to public and private spaces. HTPO integrates landscape architecture into roadway design projects to create unique, appealing finished streetscapes. Our Landscape staff has extensive experience developing pedestrian and bicycle trails throughout the Greater Twin Cities metro area. HTPO services include wetland management to promote quality projects with the least impact on the environment. HTPO staff has worked on numerous commercial, residential, and industrial projects with sustainable design solutions. 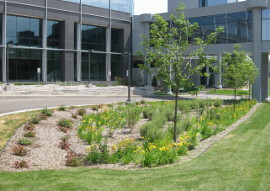 Our sustainable landscape design components have achieved LEED gold level recognition.